A Little Detour...A Tour of My Workroom!!! In the past few days, I haven't done too much on the guitar, as I am waiting for some supplies to arrive. I have, however, thickness-sanded the top and back. 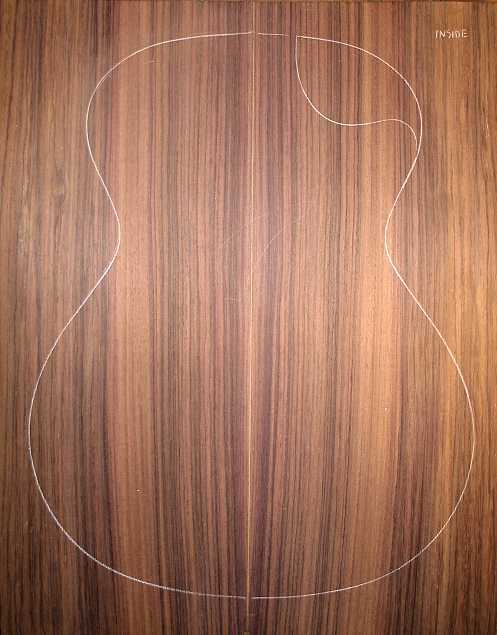 At the moment, I am debating whether or not to inlay a koa backstrip into the East Indian rosewood back, as the back has some really nice striping to it. Take a look (this is the inside surface of the back). What do you think??? Another reason I haven't gotten much done on the guitar lately is that I was busy doing various little odds-and-ends around the house. I fixed a bunch of little things I'd been putting off for the longest time — really glamorous tasks — like fixing a broken handle on Emily's (my dog's) pooper-scooper, fixing the hinge on a bathroom medicine chest door that wouldn't open, buying a new toilet seat (the cheapie plastic hinge was broken, so I went and splurged on a whole new seat with a brushed nickel hinge to match my brushed nickel sink faucet — funny how a simple thing like a new toilet seat can make you happy! ), patching a hole in my bedroom wall that Emily had, for some odd reason, decided to gnaw out....and other such tasks. BUT the main new thing I did was to continue playing around with my camcorder (which I've had for a few years, but hadn't really learned to use). Today I decided to film a video tour of my guitar workroom!!! WARNING....it's kind of long (about 20 minutes!! )....Hope you enjoy it!!! Welcome to my workspace!! !